For years, the Hong Kong’s government rejected eliminating its huge retail ivory market, and mainland China has shown itself to be more forward thinking. Yet recent events—including evidence showing that Hong Kong’s ivory traders use the legal market as a conduit for illegal ivory, public protests against the trade, and moves in mainland China toward a ban—have prompted a switch in thinking in Hong Kong: a new openness to the idea of shutting down its retail trade. Hong Kong and China both closely monitor events in the United States, where the idea of a ban on commercial sales of ivory is picking up steam. The U.S. has crushed its ivory stockpile and also announced new restrictions on its domestic ivory trade. And New Jersey, New York and California, which have significant Asian populations, have all recently passed legislation that bans the sale of ivory in their states. The following three-year timeline details steps in Hong Kong and mainland China that show a desire to reduce demand for ivory and slow down the killing of African elephants. December 2012: Hong Kong government launches “Endangered Species Specimens Donation Program” to display forfeited ivory at schools to “educate” children about conservation by sending leaflets to schools. By the end of January 2013, more than 170 schools indicate interest. April 16, 2013: Former National Basketball Association star Yao Ming launches major public awareness campaign targeting consumption of ivory and rhino horn in China in partnership with WildAid, Save the Elephants, the African Wildlife Foundation, and the Yao Ming Foundation. May 14, 2013: China’s top actress Li Bing Bing joins campaign against ivory and rhino horn trade. 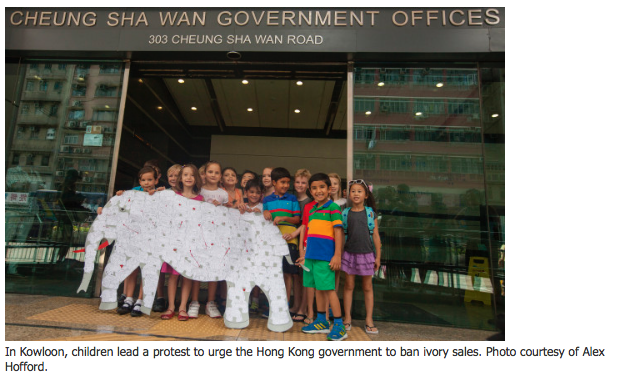 September 2013: Hong Kong schoolchildren form the “Elephant Angels” and protest ivory in schools, saying it encourages demand. They return the ivory and call for a full sales ban. September 30, 2013: China sends SMS alerts to travelers to Kenya and other countries warning them not to buy ivory or rhino horn during their stay. October 4, 2013: Protesters, including the the Hong Kong schoolchildren dubbed the Elephant Angels and their classmates, gather outside Chinese Arts and Crafts, the city’s top ivory retailer, in the first elephant march. November 15, 2013: United States destroys 6 tons of stockpiled ivory in Denver. January 6, 2014: China destroys 6.1 tons of confiscated ivory, prompting calls that Hong Kong should do the same. January 22, 2014: Elephant Angels deliver a petition with more than 18,000 signatures to Hong Kong government calling for destruction of its ivory stockpile. January 23, 2014: Hong Kong government announces plans to destroy its 29.6-ton stockpile over a one-to-two year period starting in the first quarter of 2014. February 12, 2014: Undercover video footage released of staff at two Chinese Arts & Crafts (H.K.) Ltd. stores telling customers how to illegally smuggle ivory across borders. February 15, 2014: Elephant Angels and other schoolchildren stage protest at one of the Chinese Arts & Crafts stores, handing out leaflets and talking to shoppers about source of the ivory. February 25, 2014: U.S. issues proposed rule to ban commercial elephant ivory trade. February 27, 2014: Thirty-six of China’s top business leaders—including Cao Guowei, the CEO of Sina Corporation (China’s largest Internet portal) and Jack Ma, founder of the Alibaba Group—pledge to not purchase, possess, or give ivory as a gift. March 3, 2014: Petition for ivory sales ban submitted to the Chinese People’s Political Consultative Conference (CPPCC) signed by key businesspeople and CPPCC members—including Wang Wenjing (Chairman and CEO of Yonyou Software), Liu Jun (Chairman of Eagle International Holdings), Xu Shaochun (Founder of Kingdee Software), Zhu Xinli (Chairman of China Huiyuan Juice Co.), and Yu Minhong (Founder of New Oriental Education)—and submitted by CPPCC representative Yao Ming. March 15, 2014: Schoolchildren from Hong Kong’s Clearwater Bay School stage protest at Chinese Arts & Crafts store. 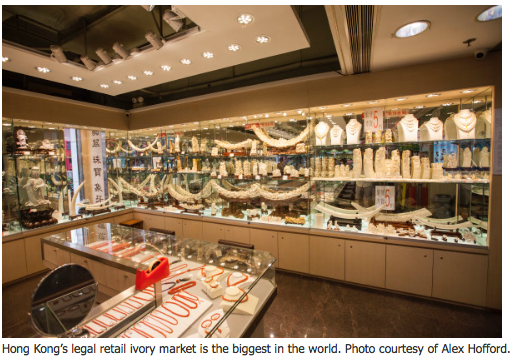 March 18, 2014: Hong Kong’s largest ivory retailer, Chinese Arts & Crafts (H.K.) Ltd., announces it will no longer sell ivory products. April 25, 2014: Hong Kong’s second-largest ivory retailer, Wing On Department Store, stops selling ivory products. May 8, 2014: Third-largest ivory retailer, Yue Hwa Chinese Products Emporium, which operates 18 stores in Hong Kong, also gives notice it will stop selling ivory products. May 15, 2014: Hong Kong starts process of incinerating its 29.6-ton stockpile of seized ivory in the largest destruction event to date. Incinerates 1.08 tons. 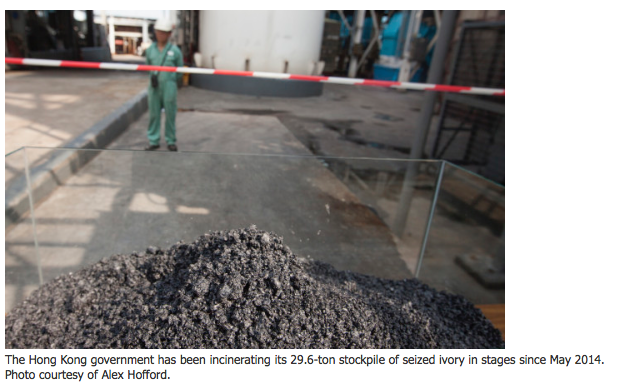 July 31, 2014: Hong Kong’s second ivory stockpile incineration: 1.01 tons destroyed. 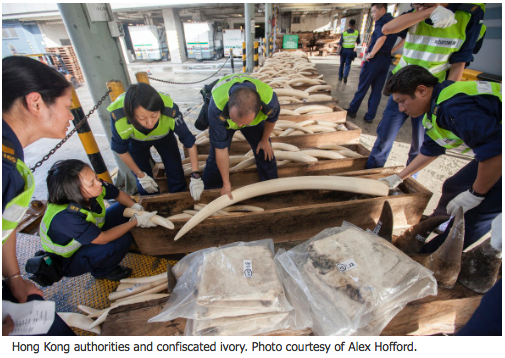 September 12, 2014: Hong Kong’s third ivory stockpile incineration: 1.25 tons. September 23, 2014: Hong Kong’s fourth ivory incineration: 1.48 tons. September 2-14, 2014: Hong Kong legislative council member Elizabeth Quat visits Kenya on a fact-finding mission arranged by WildAid and Save the Elephants. Meets with the Chinese ambassador to Kenya in Nairobi on September 12 to discuss domestic ivory trade ban in China. October 21, 2014: Hong Kong’s fifth ivory incineration: 1.5 tons. November 5, 2014: Hong Kong’s sixth ivory incineration: 1.48 tons. November 10, 2014: Hong Kong’s seventh ivory incineration: 1.3 tons. December 4, 2014: Hong Kong’s eighth ivory incineration: 1.5 tons. December 10, 2014: Hong Kong’s ninth ivory incineration: 1.45 tons. December 30, 2014: Hong Kong’s fourth major retailer, the Chinese Goods Centre Ltd., bans its ivory sales. January 21, 2015: Hong Kong’s tenth ivory incineration: 1.48 tons. January 27, 2015: Hong Kong’s eleventh ivory incineration: 1.47 tons. February 10, 2015: Hong Kong’s twelfth ivory incineration: 1.48 tons. February 26, 2015: China imposes temporary, one-year ban on imports of carved ivory. March 6, 2015: Hong Kong lawmaker Elizabeth Quat successfully lobbies 32 out of 36 NPC Members from Hong Kong to cosign a formal submission proposed by NPC member Chan Yung to the Standing Committee of the National People’s Congress to ban domestic ivory trade in China. March 10, 2015: Hong Kong’s thirteenth ivory incineration: 1.5 tons. March 17, 2015: Fifth Hong Kong youth-organized protest, involving students from four schools and more than 100 people in the Sheung Wan district in front of several ivory retailers who failed to display valid licenses for their stocks. March 27, 2015: Hong Kong’s fourteenth ivory incineration: 1.41 tons. April 14, 2015: A coalition of 51 NGOs cosign and send letter to Hong Kong’s Secretary for the Environment calling on the government to stop issuing any new import licenses and reexport licenses for pre-1989 elephant ivory. May 26, 2015: University of Hong Kong’s Public Opinion Program releases survey commissioned by WildAid, Save the Elephants, and African Wildlife Foundation that finds an overwhelming majority (75 percent) of Hong Kong’s population supports banning ivory sales. 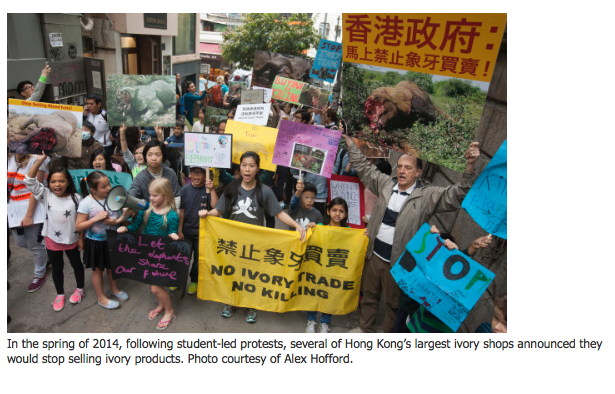 June 13, 2015: Student-led protest to urge the Hong Kong government to ban ivory sales held in the ground floor lobby of Agriculture, Fisheries and Conservation Department’s (AFCD) Kowloon headquarters. Students give AFCD 120 individually handwritten messages in the form of a large elephant collage. Across town, public event with 100+ people held at APM shopping mall in Kwun Tong with local celebrities and children organized by WildAid Hong Kong and release of public service announcement with eight local Hong Kong pop celebrities. July 21, 2015: Hong Kong lawmaker Elizabeth Quat convenes meeting attended by herself, the Permanent Secretary for the Environment Anissa Wong, two officials from AFCD, two officials from Hong Kong’s Environment Protection Department, and representatives from WWF-HK, WildAid, and TRAFFIC to discuss domestic ivory trade ban in Hong Kong. First time the government admitted loopholes in the current controls on domestic ivory trade. July 23, 2015: Hong Kong’s fifteeth ivory incineration: 1.27 tons. This leaves 7.3 tons of ivory still to be disposed. August 28-September 11 2015: Hong Kong lawmaker Elizabeth Quat visits Kenya and Tanzania on her second fact-finding mission. Meets with the Chinese ambassador to Tanzania on September 6 to discuss domestic ivory trade ban in China. September 7, 2015: WWF-Hong Kong releases its report The Hard Truth, outlining regulatory weaknesses in Hong Kong’s legal ivory market. Undercover video footage by independent investigators (and provided to WWF-Hong Kong and WildAid) shows that traders top off their legal stocks with illegal ivory. October 19, 2015: Prince William records message to Chinese people on the illegal wildlife trade for broadcast on Chinese state TV channel CCTV1 on October 20. October 23, 2015: WildAid, in conjunction with African Wildlife Foundation, releases its report Illusion of Control, which explains abuse of Hong Kong’s licensing system. Undercover video footage by independent investigators (and provided to WWF-Hong Kong and WildAid) released with English subtitles shows traders topping off legal stocks with illegal ivory.